Fox Tales is another show which made a lasting impression on us as children. The show was broadcast in 1985 on ITV and was part of Central's programming. 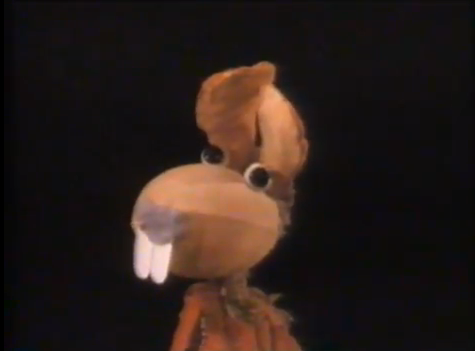 The episodes had their roots deeply entrenched in Eastern European folklore featuring talking animals living within a wood. The show utilised black light theatre techniques which led to a real emphasis on the puppets and freed them from marionette strings. 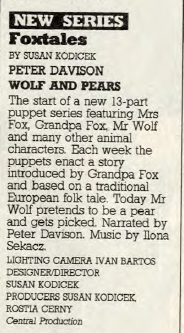 The main characters - as the title suggests - were foxes: Grandma Fox and Mrs Fox. The 'tales' took the form of short 11 minute stories with a similar emphasis on moral understanding to that of Aesop's Fables - a series of tales which, again, featured talking animals. In total, there were 13 episodes produced. Susan Kodicek and Rosta Cerny (below) were the producers of the show. Kodicek was perhaps best known as Irina in the 1979 TV mini series of Tinker Tailor Soldier Spy. The two met at the birth of the Black Theatre Group of Prague and this started their path towards television. 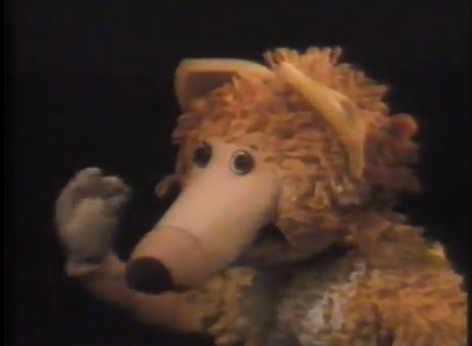 Preceding Fox Tales they also produced the children's shows Once Upon a Time and Pullover. All three shows were produced by Kodicek and Cerny's production company Pullover Productions. Fresh from his stint as the fifth Doctor Who, Peter Davison was on hand to provide the voices in Fox Tales. Our memories of Fox Tales were that we remember finding it quite creepy and even had a nightmare about it once. Reading up on the series, 25 years later, we now understand that the black light theatre element was probably the cause. The mysterious, shadowy backgrounds leave you wondering what could be lurking behind the genteel tales. They also allow for a range of movements more fluid than puppets on a string or stop motion animation. 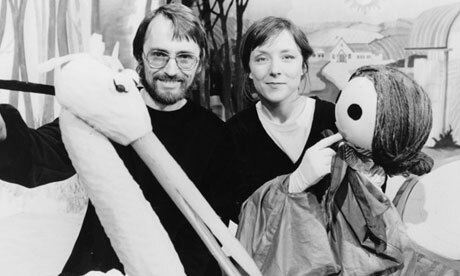 The fact that we can remember the show so many years later is a testament to the creativity that Kodicek and Cerny were able to foster. One other memory we have of the show from our youth is being in WHSmiths and seeing a Fox Tales book on the shelf. Searching the internet, we've found that there were several of these published in 1986 by Magnet Books - all are based on the TV stories. 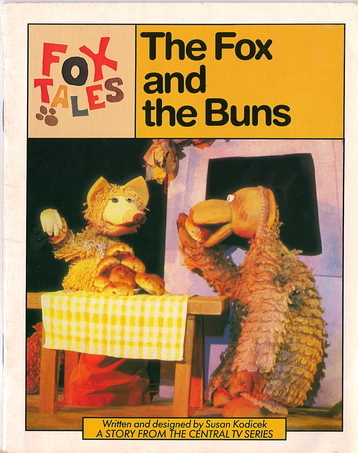 The copies we've found for sale are The Fox and Buns (see below), The Cat and the Rooster and The Bear and the Mushrooms. In April 2013, we were delighted to be contacted by Susan Kodicek's son, Danny. He advised us that he had recently got hold of the entire series of Fox Tales and was uploading the episodes to YouTube. This was fantastic news as we had wondered when we would get to see some more. The episodes can be viewed at http://www.youtube.com/user/flatfrog00 and help build a more detailed understanding of the show. Several other pieces of his mother's work have also been uploaded, so we recommend heading over there. With access to the episodes, we can finally relive that curious part of our youth and also take a good look at the series as a whole. Mrs Fox is at the core of all the stories, but interestingly she takes on the role of protagonist and antagonist throughout the series. As discussed above, morals are the main drive of the story and these promoted well by the array of woodland creatures. The creatures often teeter on the brink of being eaten by one another, but they always manage to escape their pursuers digestive tracts. 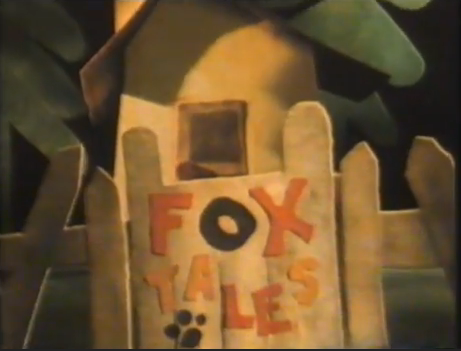 We were surprised that Fox Tales was premiered in the late afternoon CITV slot as the stories themselves are quite basic. This was, of course, when the viewing age of CITV was a lot older than that of its later years, so it seems a strange timeslot. A lunchtime slot would, perhaps, have been more suited to the content. The puppetry method of black theatre gives the characters a lolloping gait and, coupled, with the shadowy, black backgrounds gives the show a unique look and atmosphere. Adding to the atmosphere is the wonderful score by Ilona Sekacz. Using horns and pianos, she matches the action, particulary the movements of the characters with great skill. The series has a classy sheen to it and appears to be filmed on film rather than videotape, but we couldn't determine if it was 16mm or 35mm. All in all, the look of Fox Tales is the hook for us, it's got such a strange fairytale look to it that was perhaps matched - at the time - only by The Moomins, another series entrenched in European folklore. It's been interesting - I haven't seen these in years myself. I always had more of a soft spot for Pullover, their first series, partly because I had a small part in it, of course, but also because as a piece of storytelling it's more unusual. Fox Tales is quite a traditional series, although it's cleverer than it seems at first glance because of the way it weaves classic stories in with a set of stock characters. I wish they'd been able to make more of them because I think it might have grown into something brilliant. As it stands, I think it's still a bit flawed - in particular, the puppetry just doesn't feel as polished as it does in Pullover for some reason, although the visual design is stunning and the music is beautiful. I was interested to read that it gave you nightmares! I think in many ways that's a tribute to how good it is - the deep dark forest of fairytales shouldn't be an entirely comfortable place! My mother struggled throughout her career with the problem of being too dedicated to being faithful to the material she was working with. She was constantly frustrated that the series she and Rosta devoted so much care to were always being eclipsed by rather crude shows like Button Moon, their most obvious competitor, or inane nothings like Postman Pat. And she was unlucky to be in at the tail end of the puppetry boom of the 70s and early 80s, which was broken by the arrival of cheap animated series such as He Man and Transformers. So her programmes didn't have time to build up the fond fanbase that other shows found. Still, I'm hoping that I'll get a few of them out of the woodwork - I've had a fair number of people saying how much they appreciated seeing Pullover again after I uploaded those episodes. If you get a chance, take a look at Godfather Death, her very last piece of puppetry, made only a short time before she made her feature film A Pin For the Butterfly. Although it's spoiled by a terrible narration, in terms of the design and direction it was the one she was most proud of, and I think it's wonderful.